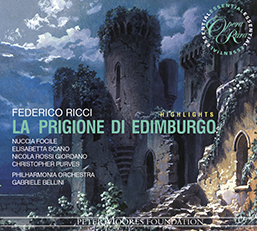 Immensely popular in its day, La Prigione di Edimburgo provided two hits – the lullaby, Dormi, dormi bel bambino, gloriously sung on this recording by Nuccia Focile, and the baritone aria, Sulla poppa del mio brich, performed by the accomplished Christopher Purves. 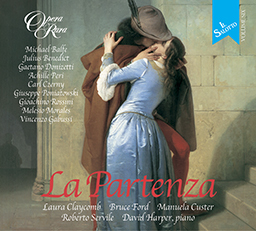 Opera Rara continues its Essential Opera series with the second volume, Federico Ricci’s La Prigione di Edimburgo. Once again, specially selected highlights, representing the heart or essence of the work, are presented on just one disc. 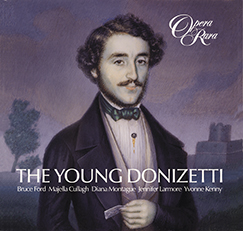 Immensely popular in its day, La Prigione di Edimburgo provided two hits – the lullaby, ‘Dormi, dormi bel bambino’, gloriously sung on this recording by Nuccia Focile, and the baritone aria, ‘Sulla poppa del mio brich’, performed by the accomplished Christopher Purves. Like Donizetti’s Lucia di Lammermoor, the work is based on a Walter Scott novel, this time The Heart of Midlothian. Booklet includes complete libretto, with recorded music shown in coloured text, with English translation. In the countryside outside Edinburgh, reapers have just finished their day’s work, and come to collect their wages from Fanny Anders, the daughter of their employer. The following day is to be a day of festivity, celebrating the end of the harvest, and Fanny tells them that it will be an even happier occasion than they had anticipated, since her sister Ida, who has long been absent in Edinburgh, has come home for the occasion. After all have dispersed, Ida makes her appearance – not from her father’s cottage, but from a pavilion, the property of some landed family, further up the hill in the background. We learn that she has left her baby son asleep there, a son who is a source of both joy and sorrow to her, for, married in secret, she now fears that her husband has abandoned her. The villagers greet her warmly, but their delight at seeing her again only heightens her inner distress. After Ida has gone into the family cottage to attend to her invalid father, Giovanna appears. Giovanna is a madwoman, and everyone believes that she has lost her wits as a result of an unhappy love affair. She continually imagines that she has a baby – a baby son who, we learn in Scott’s novel though not explicitly in Rossi’s libretto, has actually died – in her arms, and that all her troubles will be over as soon as her lover, a certain Giorgio, returns. Giorgio was a smuggler who once found shelter in her mother’s cottage when fleeing from the law, and who subsequently escaped to sea, leaving her pregnant. Now, as she climbs the hill and passes the pavilion, she hears the sound of a baby crying. The door is locked, but she manages to force open a window, and is soon afterwards seen hurrying away, carrying something – a something which the audience realises is Ida’s baby – beneath her cloak. A vessel anchors off the coast, and a man rows ashore. This is Tom, captain of a band of smugglers, a boisterous and hearty fellow who boasts that he was born aboard a prison hulk, raised on Madeira, and has never swallowed so much as a drop of water in his life. He comes to pick up one of his mates, Giorgio – who is, we realise, none other than the husband of Ida and the seducer of Giovanna – but though they duly meet, Giorgio insists that he needs one hour more to keep an assignation. A grumbling Tom climbs the hill to keep watch, for customs officers are believed to be patrolling the area. Giorgio’s assignation is with Ida, whom he has not seen for six months, and for whom he has been searching since returning to Scotland the day before. They greet each other with joy, but their tête-à-tête is soon interrupted by Tom, who confirms that a detachment of soldiers is all but upon them, and reports that he overheard a courier bringing news of the arrival in Edinburgh of a new king’s representative, the Duca d’Argil (the Duke of Argyle). Giorgio and Ida take a hasty and regretful leave of each other, and Tom and Giorgio put to sea. The soldiers arrive, but they are not in search of smugglers. Their leader, Patrizio, stops at the home of Fanny and Ida, and arrests Ida on the grounds that she has borne an illegitimate child and murdered it. Ida protests her innocence, but when she goes to the pavilion to produce her son, of course the baby is not there. She is led away, in an extreme state of distress, to Edinburgh. In the royal palace of Edinburgh, the nobility and citizens of Edinburgh greet the newly arrived Duca d’Argil, who declares that he has come to quell unrest and heal civil division. Patrizio seeks pardon for a young man who, though he has been fighting on the side of the rebels, is now repentant. It is none other than Giorgio, who, we discover, is the Duca d’Argil’s wayward son. Father and son are reconciled, and the Duca orders that it be announced that Giorgio has just returned from travels abroad. We also learn that Giovanna, insulted and struck by one of the smugglers, has delivered the band into the hands of the law. She and Ida, whose fate is about to be decided in the adjacent courtroom, meet and realise that they are rivals, both in love with the same man. Giovanna admits that she always knew she occupied only second place in Giorgio’s affections, but she is confident that, when he learns of Ida’s crimes, and sees her own beautiful baby boy, he will transfer his affections to her. Ida is summoned to face her judges. Giorgio reappears, dressed as befits his reassumed rank. He has been appointed his father’s secretary, and one of his first duties is to choose a new chief gaoler. Patrizio introduces, as a suitable candidate, the leader of the captured smugglers – Tom – and Giorgio is, of course, immediately recognised. Tom finds, however, the offer of the job as head gaoler highly tempting, and promises to hold his tongue and keep his friend’s secret. As all await the outcome of Ida’s trial, Giovanna, still wandering in her mind, sings a lullaby to the child she imagines she holds in her arms. She catches sight of Giorgio – is overwhelmed and faints – and yet in her imperfect state of mind has scarcely more than half recognised him. Ida is found guilty and condemned to death. Giovanna, who has hitherto regarded her as a rival, now clings to her, imagining that they are both equally unfortunate and should support each other. They are separated, and Ida is carried, in a state of collapse, away to prison. An anguished Giorgio is dragged away by his father. The central courtyard of the prison of Edinburgh (the ‘Heart of Midlothian’), where the prisoners are drinking, singing, and playing at cards and dice. They have heard that they have a new and severe head gaoler, but when Tom appears, they soon succeed in inducing him to drink with them and join in their songs. Giovanna has been apprehended for pilfering prison provisions, but tells Tom that she needed them, not for herself, but for her son. She still imagines that she is to be married ‘as soon as Giorgio returns’, and is anxious to attend to the preparations for the wedding. Giorgio enters, hoping to be able to see Ida once more. He had planned to rescue her with the aid of the smugglers, but since the arrest of all those ashore the day before, the remainder have put to sea once more, leaving him on his own and consequently helpless. Giovanna, who still does not recognise him, starts talking about her son, and from her words he soon suspects that the baby is really Ida’s. He tries to convince her that he is indeed Giorgio, but at first, deceived by his fine clothes, she refuses to believe it. He gradually convinces her, but they are interrupted by the sounds of a crowd that has gathered outside the prison to witness Ida’s execution. Giovanna, alarmed by the noise, drags Giorgio away to help her retrieve the baby from an old bell tower, visible at the back of the stage, where she has left him. Tom gives the alarm that the prisoners have set fire to their cells. The fire spreads rapidly, and is soon seen consuming the bell tower. Giovanna appears at the summit, where she attaches a cradle to the end of a bell rope lowers it to safety. As she sees Ida receiving the baby at the base of the tower, she cries out ‘I took him from you – I give him back to you.’ She then resigns herself to the flames as, below, the Duca opens his arms to Giorgio, Ida and the baby.